Ah, happy hour. That glorious early evening window when you can fill up on tantalizing drinks and snacks without wincing at the bill. From two-for-one cocktails to half-priced appetizers, happy hour is a weekday mainstay for epicureans on a budget. Boise has an abundance of wallet-friendly happy hour options, spanning from mid-afternoon bites to lush late-night feasts. Check out these eight Boise restaurants for sweet deals on drinks and food. 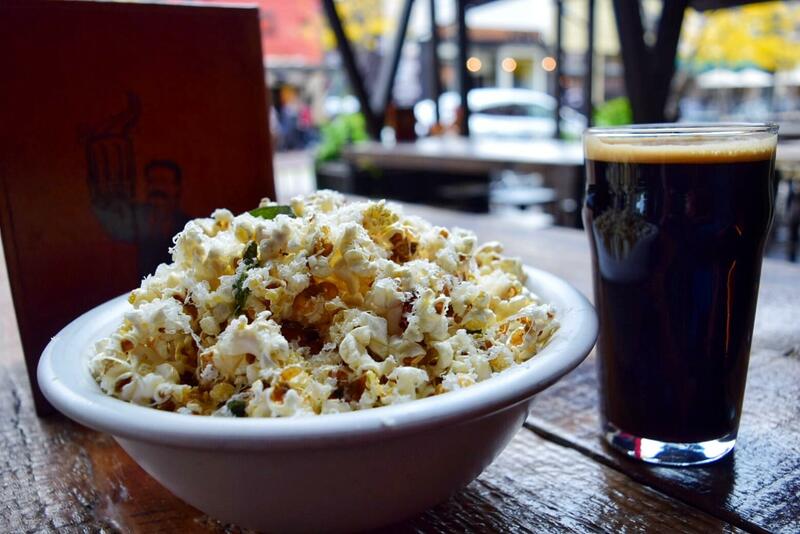 Enjoy a Boise Brewing Milk Stout and Duck Fat Bacon Popcorn. Happy Hours: Mon.-Fri., 3-5:30 p.m.; late-night Wed.-Thurs., 10-11 p.m.; Fri-Sat., 11-1 a.m.
Bittercreek’s Low-Power Happy Hour invites patrons to “drink by candlelight” to reduce their energy footprint. With a relatively early 3 p.m. start time, Bittercreek’s happy hour boasts $3 Boise beers, $5 Cinder wines and $5 Fuzzy Leopard cocktails made with a local herb cordial. The pub also slings an assortment of reduced price snacks, including Kurobuta Pork Tacos ($2) from Flying Pig Farm topped with habanero carrot pico, and free-range Turkey Poutine from A+ Turkey Ranch ($5) served with Ballard cheese curds, handcut fries and gravy. Try This: Boise Brewing’s Dark Daisy Chocolate Milk Stout ($3), paired with a bowl of Organic Popcorn ($4) drizzled with sage-infused duck butter and tossed with glazed bacon. Dive into this fun option at Mai Thai. Happy Hours: Mon.-Thurs., 5-6:30 p.m. and 9 p.m.-close; Fri.-Sat., 5-6:30 p.m. and 9:30 p.m.-close; Sun., 5-9:30 p.m.
Mai Thai’s two-for-one happy hour has been drawing in downtown imbibers for years. Most of the bar’s libations—from the Tiger Blossom ($10), made with Hendrick’s gin, pomegranate liqueur, St. Germain, agave and yuzu juice; to the Lemelson Vineyards Pinot Gris ($9)—are two-for-one, two times a day. And the best part? You can mix and match your drinks so you’re not stuck with the same thing twice. Mai Thai also offers a new happy hour food menu, which includes items like traditional Vietnamese Chicken Wings ($6) marinated in fish sauce with pickles, alongside housemade BBQ Pork Ramen ($5) with cabbage, sugar snap peas and a poached egg . 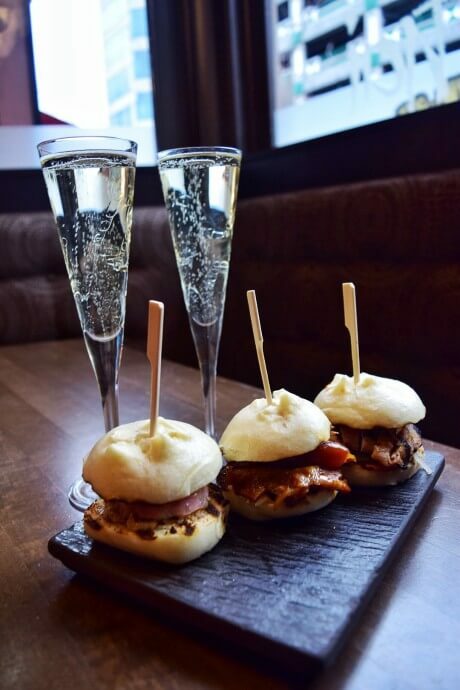 Try This: A glass of Cavit Lunetta prosecco ($8), paired with a trio of Housemade Bao Buns ($6) stuffed with pork leg, naem sausage and grilled pork in spicy sauce. 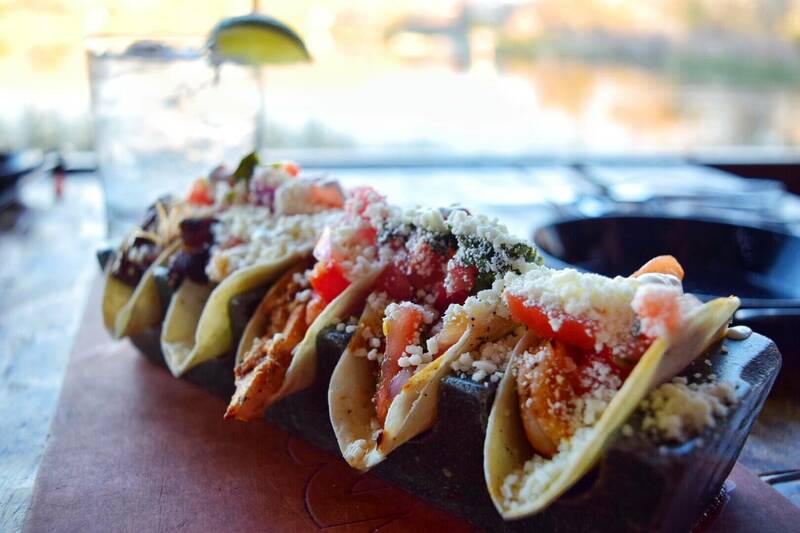 These mini tacos may just hit the happy hour spot. Happy Hours: Mon.-Sun., 4-6 p.m.; Thurs.-Sat., 10 p.m.-close, reduced-priced wells. Whether you snag a seat at Barbacoa’s long wood bar or on the enclosed back patio overlooking Parkcenter Pond, the eccentric restaurant’s two-for-one happy hour is sure to get you fired up. The special extends to everything in the bar—from the Paloma ($9) with Herradura Blanco tequila, grapefruit soda and lime to a glass of Sokol Blosser wine ($9). While Barbacoa doesn’t offer food discounts during happy hour, there are a few budget friendly small plates that are great for sharing, like the popular tableside guacamole served in a stone molcajete ($9) or the Spanish meatballs lacquered in a smoked paprika tomato sauce ($9). Try This: A Botanist gin and soda ($8) paired with a brick of five Mini Tacos ($9) stuffed with your choice of shrimp, carnitas, barbacoa, chicken tinga, carne asada, blackened calamari or blackened fish. 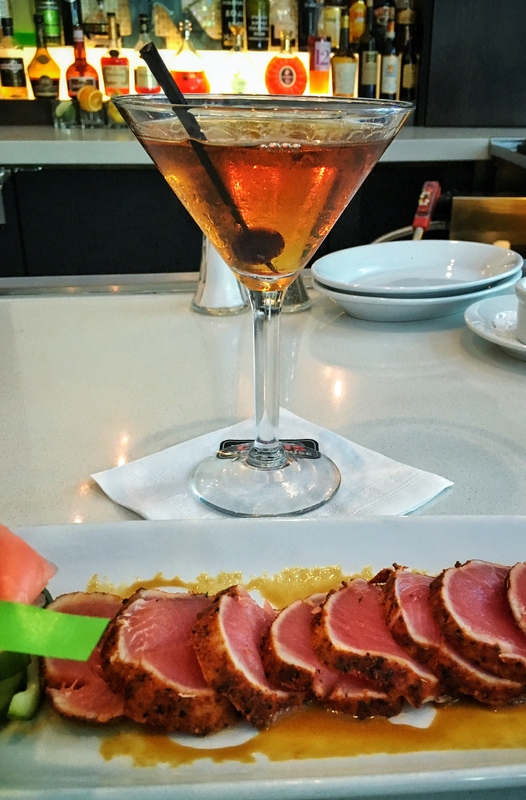 Cheers to this ahi tuna dish during happy hour at Ruth’s Chris. Happy Hours: Mon.-Sun., 4:30-6:30 p.m. If you’re looking to saddle up to the bar at Ruth’s Chris’ popular happy hour, you’ll need to arrive as close to 4:30 p.m. as possible. The Sizzle, Swizzle, Swirl happy hour is served in the bar area only and includes $8 snacks—like the Crab BLT with roasted red pepper ranch or the Grilled Tenderloin Salad with roasted asparagus and bleu cheese crumbles—along with $8 drink specials, like the Pomegranate Martini with Smirnoff vodka and Cointreau. Try This: The Ruth’s Manhattan ($8) with Jim Beam bourbon, Noilly Prat sweet vermouth and Southern Comfort, paired with Seared Ahi Tuna ($8) in a ginger mustard sauce. No need to leave hungry. Happy Hours: Mon.- Fri., 4-6 p.m. and 10 p.m.-close. With large front windows that splash light onto reclaimed wood and warm red brick walls, Juniper is a lovely place to while away an afternoon. And the restaurant’s two-for-one happy hour makes slipping out of work early even more enticing. Juniper’s happy hour cocktails include the Juniper Gin and Tonic ($8) with housemade tonic syrup, and the Moscow Mule ($8) with vodka, lime and ginger beer. Food specials range from house-cut Rosemary Fries ($2) with horseradish fry sauce to the Parmesan-topped Corn and Leek Gratin ($4). 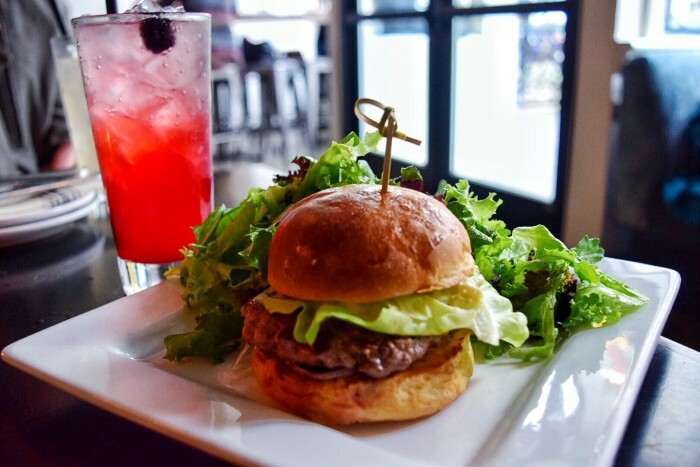 Try This: The Blackberry Collins ($8) with gin, blackberry syrup, lemon and soda, paired with the Juniper Happy Hour burger ($5) on a brioche bun with onions, pickles and aioli. Try something new like this Octopus Salad during Chandlers’ happy hour. Happy Hours: Mon.-Fri., 4-6 p.m. If you’re feeling fancy, head to the blue-lit bar at Chandlers for Social Hour. Cocktail specials include the 44 North Nectarine Lemon Drop ($8) and the Bitter Hombre ($7) with Lunazul Reposado tequila, Cynar, Carpano Antica and orange bitters. Snack options range from the Mini Tour of Tuna ($8)—with fresh ahi and hamachi, avocado, tomato and red onion—to the Steak Tartare ($8) with raw filet mignon, capers, shallots, chives and a quail egg. 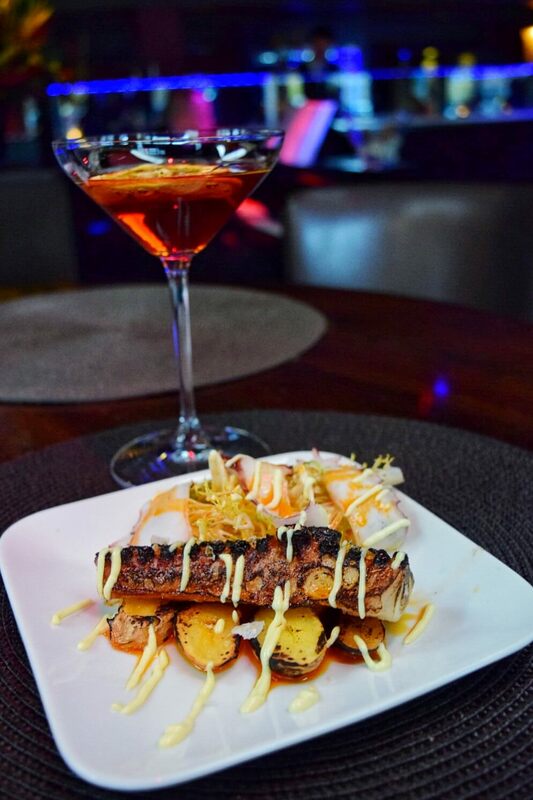 Try This: The Bitter Truth ($7) with Evan Williams bourbon, Cynar artichoke liqueur, Carpano Antica and orange bitters, paired with the Charred Octopus Salad ($9) with tender octopus served on a bed of frisee with smoky pimenton de la vera and garlic aioli. Serve up something delicious during happy hour at Flatbread. Happy Hours: Mon.-Fri., 4-6 p.m.; Fri.-Sat., 9 p.m.–close. Located on the second floor of the gleaming Zion’s Bank Building, Flatbread boasts one of the best happy hours in town. The Neapolitan pizzeria offers 50 percent off all poured drinks—cocktails, draft beers and wines by the glass—along with an assortment of food specials, like a chili-glazed shrimp and chorizo flatbread ($5) or a pot of gooey Fontina Fonduta served with fresh bread ($6). 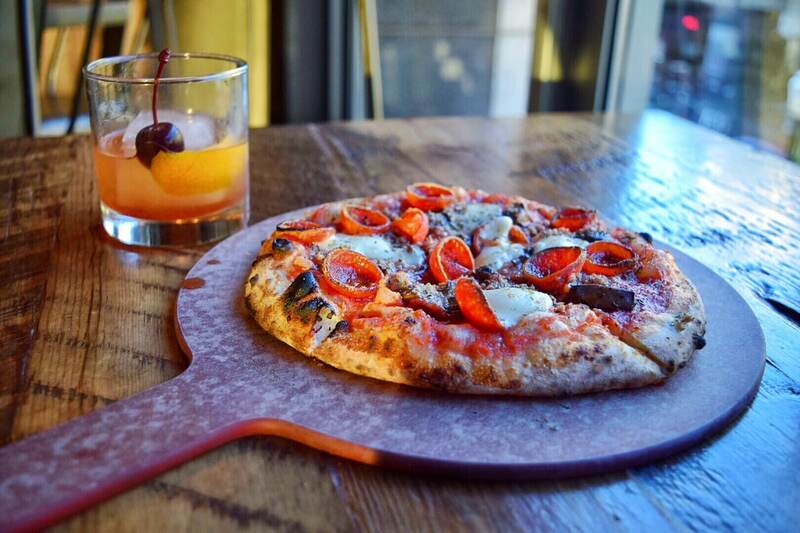 Try This: The Eastman Old Fashioned ($4.50) with Bulleit Rye, Fee Brothers barrel-aged bitters and a Bada Bing cherry, paired with a Pepperoni-Sausage-Mushroom Pizzetta ($6). Enjoy patio views and savory bites at Bardenay. Happy Hours: Mon.-Sun., 4-6 p.m.; Wed.-Thurs., 9-10 p.m.; Fri.-Sat. 9-11 p.m.
With its primo people-watching patio on Boise’s Basque Block, Bardenay beckons revelers with an assortment of house-distilled spirits, like gin, vodka and rum. Though the bustling restaurant doesn’t technically offer any happy hour drink specials, its house-crafted liquors are all $4, served straight or with a soda mixer, all the time. Food specials include Plum-Glazed Chicken Wings ($6.75) and Spinach Artichoke Dip ($4) with flash-fried pita wedges. 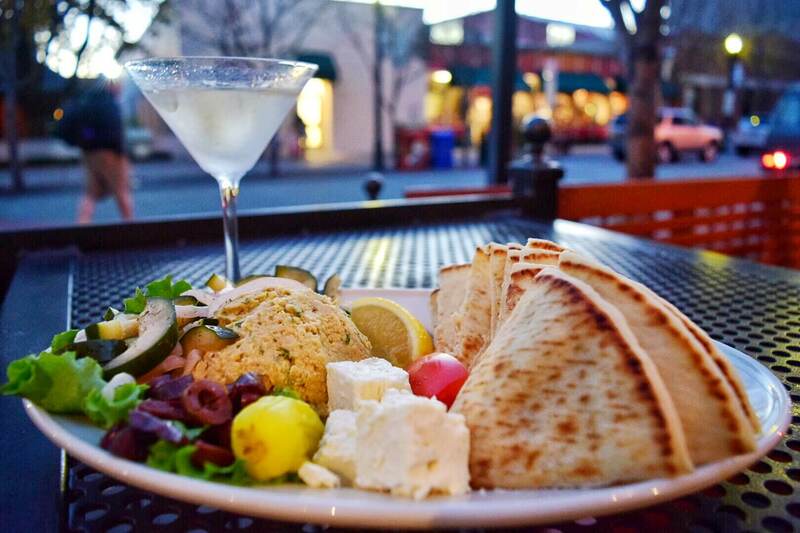 Try This: The Bardenay Gin Martini with a lemon twist ($6.50) paired with a Hummus Plate ($4) with feta cheese, kalamata olives, lightly pickled cucumber moons and fresh pita triangles.